Obverse: Facing, stylised, portrait of Richard III wearing a crown. Text around RICARD DI GRA REX ANGL FRANC. Reverse: Long cross with trefoil of pellets in each angle. Text around outside, POSVI DEVM ADIVITOREM MEVM (I have made God my helper). Text around inside, CIVITAS LONDON (City of London). History: Richard III did not enjoy the throne for long, 1483 to 1485. Richard III’s coinage followed the pattern of previous reigns with the portrait remaining stylised, though this increasingly became more distinctive. His coinage can be divided into three types according to the mintmark. Type 1, the sun and rose coinage, lasted 24 days to 20th July 1483. 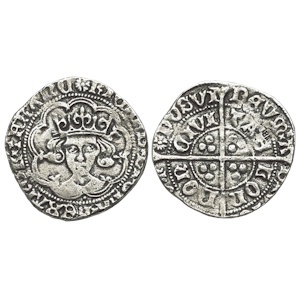 Type 2, the boar’s head coinage, was issued until June 1484. Type 3, the sun and rose coinage, was struck until the end of Richard III’s reign.